Sometimes the best things are unplanned. I had almost stopped waiting for my visa for India to arrive and then, just two days before the conference, I had it in my hands. Being my usual, spontaneous self, I immediately rushed to the travel agency to book my flight only to be informed that I was too late to get a hold of any direct flight to Delhi that week. Adding to my disappointment, other flights were costly and booked as well. After hours of sheer persistence, my friend and I managed to secure a connecting flight with three stopovers; Doha, Abu Dhabi, Mumbai and, finally, to our much awaited destination: Jaipur. The ticket cost us twice as much as any direct flight would have and was just as inconvenient considering we would arrive in the nick of time on the day of the conference. But to both of us, all these matters were rendered trivial; our money wasn’t being spent on a trip, but on the opportunity to bank innumerous memories that we’d revisit for a lifetime. India: A glorious part of our subcontinent; the land of our forefathers. I could almost taste the Bombay biryani. There were so many things that awaited me: Lucknow’s Urdu, saris from Banaras, Rajasthani jewellery and of course, Bollywood. We arrived in Mumbai where we had a long stopover. 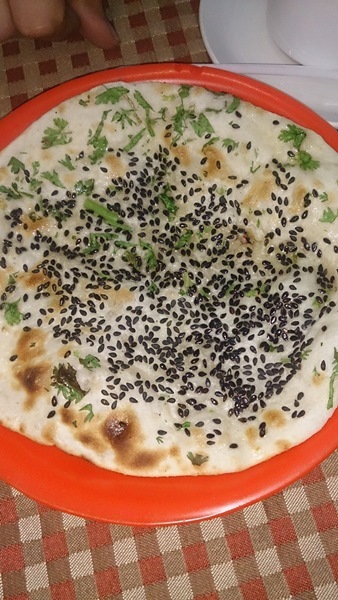 Our first meal in India was Roghni-kalonji naan (nigella seeds bread), as advised by the airport staff. We had our quick meal and headed back to the Mumbai airport after which we caught a domestic flight to Jaipur. Early in the morning, we reached Jaipur airport where our dearest friend, Professor Mohan, came to receive us. I had seen him in pictures but had never met him in person. While my friend was searching for him, I spotted a man wearing a hat; the signature hat of Professor Mohan. We received a very warm welcome from him. The weather was surprisingly cold with affectionately chilly winds when we arrived even though it was the first week of March. He told us that it had never been like this in this season. Delighted, he exclaimed that we brought the downpour and lovely weather from Islamabad to the arid and hot Jaipur. While we waited for other guests from other countries to arrive, he offered us tea from the nearest stall; the finest garma garm chai (hot milk tea). On our way to the hotel, I noticed Jaipur was enveloped in a green blanket of fresh flora. The roads were also clean. The foliage and freshness attracted me. In some places I couldn’t feel the difference between Jaipur and Islamabad. It was almost as if I was in one of the sectors of Islamabad. Our hotel was a few minutes’ walk from Rajasthan University. Despite access to transport, we preferred walking to appreciate the local culture. We loved walking through the streets, strolling around town, visiting small shops and encountering the echoes of the British raj (rule) at every corner. While touring, I noticed that respecting animal life was inherent in their culture; monkeys roamed around freely at the forts, people fed birds by the road side and stray dogs scampered with no objection from the people. 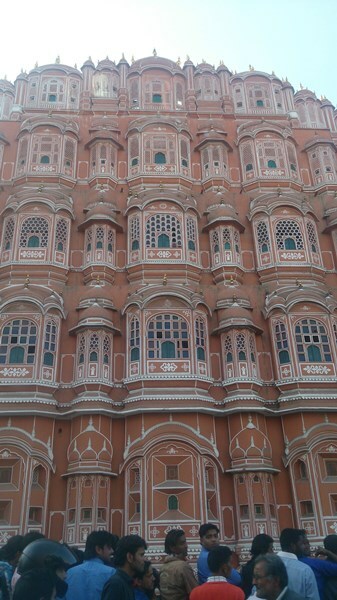 In my opinion, Jaipur is one of the most attractive locales I have ever come to experience. 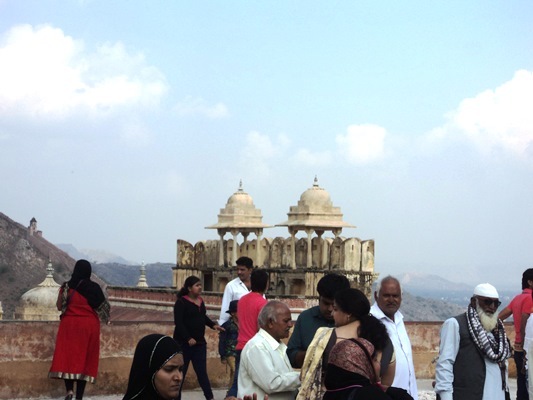 One fine day, we hopped into a minivan to visit Amer fort; a beautiful fort that the government has maintained quite well. 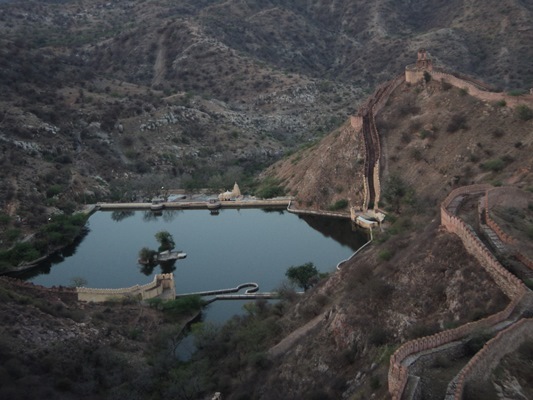 The fort snakes through the hilly area of Jaipur where there are a lot of tourists and locals. 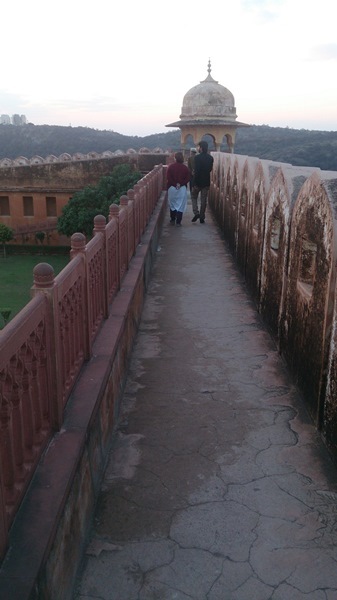 The structure of the fort was magnificent and told a story. Sometime you need to commune with old places to feel mystic. There was an aura of peace and serenity. I took my time to absorb the atmosphere, wanting to absorb with both mind and heart, while I remained there struck with awe and amazement. Jaipur is an entrancing city of royal residences with a whimsical view of the Jal Mehal (Water Palace) serving as a stopping point along the way. It makes for a dreamy location. 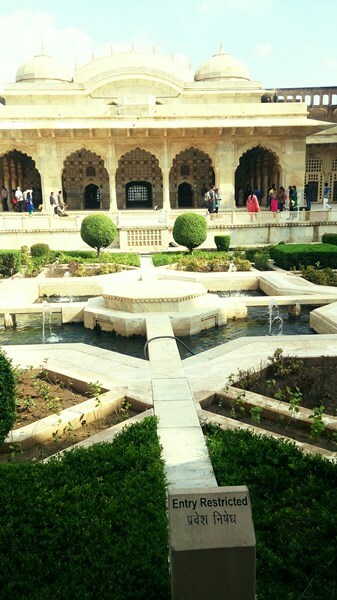 Jal Mehal and Hawa Mehal (Palace of Winds) are the most inspiring sites. I spent sufficient time with my face lost in one of the windows of Hawa Mehal. 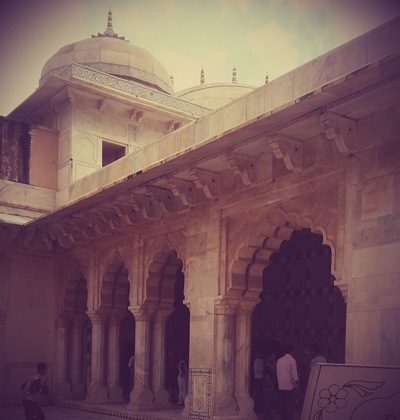 It was a wonderful experience to go to India and soak myself in the allure of forts and palaces. The next day, we went to Jaigarh Fort. It was closed as all official sites in Jaipur close past 5pm but thanks to our friend from the history department, the gates were opened for us so we could enjoy its serene environment before we left. Our tour was guided by a local who made it thoroughly enjoyable. 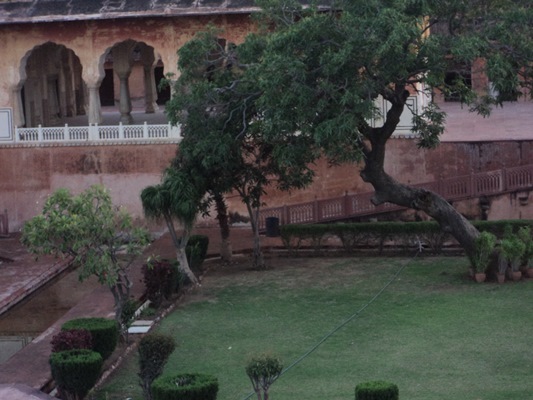 The fort is set in beautiful red sandstone and has different levels of gardens which were watered by canals. I wanted to explore the gardens of the palace but I was lost in the past pondering over how honourable their history was. They say, “the best way to honour the past is to preserve it,” and our Indian brothers seem to have done a really good job achieving just that. The fort was quite magnificent to see. One of the architectural marvels at the fort complex was Badal Mahal (Palace of Clouds) with a dramatic staircase ending in the stunning garden. It is said that members of the royal family would sit there to enjoy the fresh mountain breeze and see the clouds cascading into the garden sky. The mesmerising beauty of the fort was enough to disconnect from the world. While roaming around and losing ourselves amidst its beauty, I thought of all the ancient souls that once lived there. And before I knew it, it was dusk. I didn’t want to think about tasks I had yet to undertake that day. I continued to sit there wishing for time to stand still. 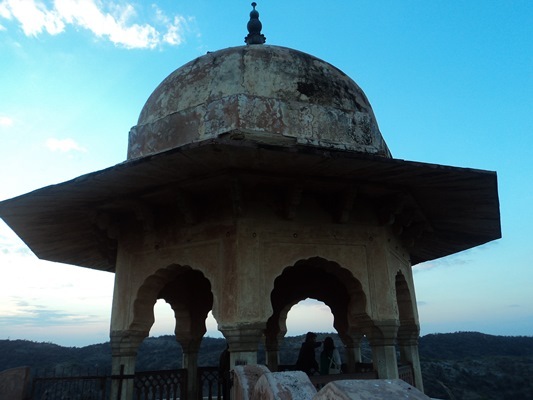 If you ever want to see one of the most beautiful sunsets, go to the top of Jaigarh Fort, an utterly compelling destination. A beautiful song in Rekha Bhardwaj’s voice played in the car as we moved through the older part of the town. 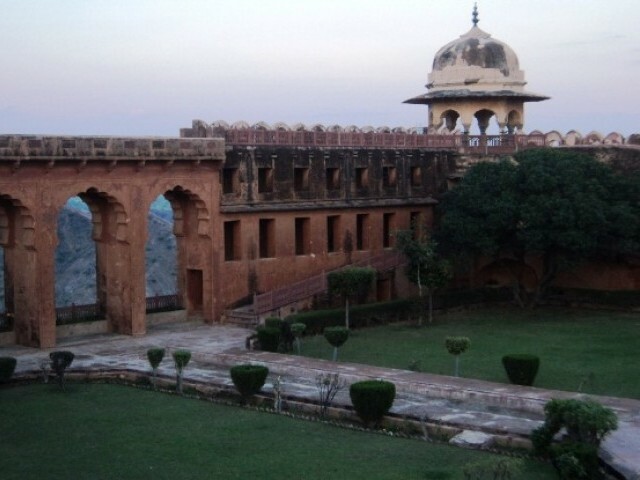 You simply can’t leave Jaipur without seeing the old pink part – Jaipur is also called the Pink City. 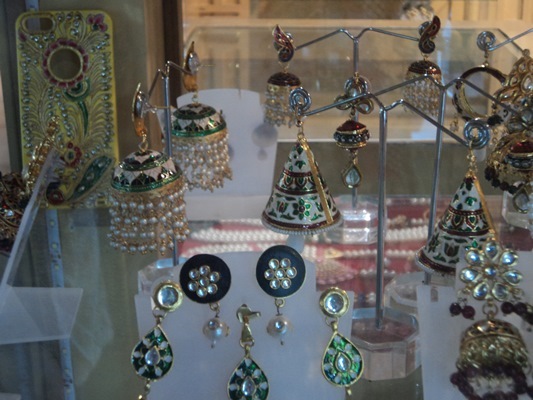 We decided to walk through the crowded bazaar of the old city of Jaipur. 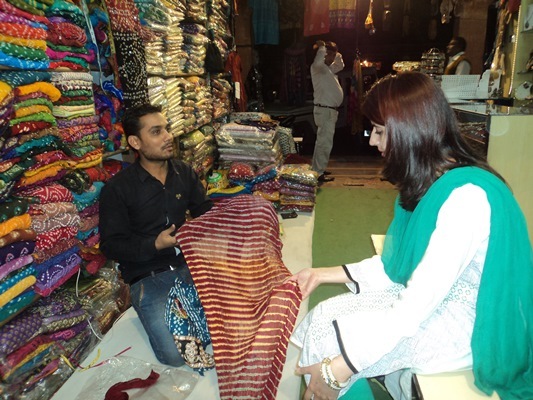 I was fascinated by the brightly coloured handmade bangles, chunri and saris. I bought jewellery, saris and a pressure cooker (let me tell you one thing; Indian cookers are famous in Pakistan. My colleague’s mother had specifically asked me to bring one). Even the shopkeepers were kind and continuously asked about Pakistan. Last but not least, we entered the grand Birla Mandir, a Hindu temple. Regardless of their belief and faith, anyone could enter as long as they are dressed appropriately. We spent some time at the brightly lit temple in the evening. I was astounded by the architectural brilliance of this white-marbled building with three huge domes, each representing different approaches to the religion. There were scenes of Hindu scriptures on stained glass windows and carvings of deities, historical figures from all regions and mythological themes on the exterior walls. I simply sat down and enjoyed the view, listening to the Azaan (Muslim call of prayer) from the nearby mosque along with the bells from the temple. At sunset, it was overwhelming to hear the Maghrib Azaan, beautiful, loud and crisp. Men started moving towards the mosque. 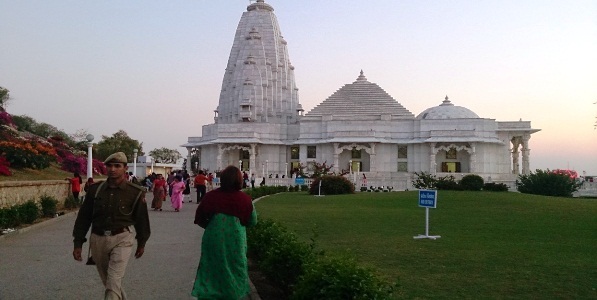 After 10 minutes, the bells of the temple rang and puja (Hindu worship) started in the most melodious voice. No disturbance, no hatred. Everyone was busy in their prayers without disturbing the other. I felt Jaipur changing my impression of India. Our visit ended with an elegant dinner at an exclusive hotel called Virasat (Heritage). I thoroughly enjoyed the ambiance of the hotel. There was live Rajasthani music in the hall with a girl performing a traditional dance. 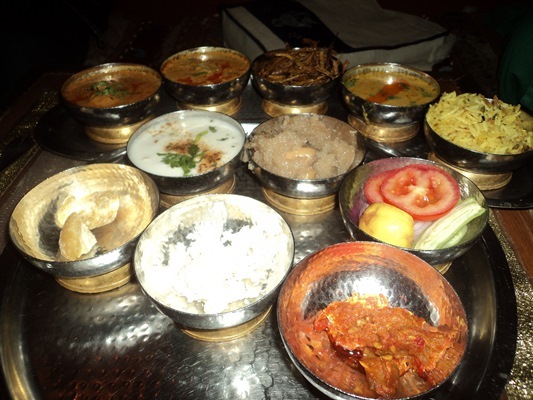 A big thaal (platter) full of tantalising dishes, served with all sorts of local delicacies. While enjoying our last dinner in Jaipur, I thought that despite the many hurdles involved at the start, the travel to India was truly worth it. I was able to experience a city enriched with history, tradition, religion and architecture. The fear of visiting a supposed enemy territory completely vanished. It is rather unfortunate that the power of the media is often used to instil such hatred between our countries. My preconceived notions bit the dust as soon as I landed. There were so many people genuinely interested in getting to know us and about Pakistan. Despite notions propagated by the media, there wasn’t a single place we got stuck at or found any evidence of ill will. From the immigration office to the people of Jaipur, everybody treated us with respect. They smiled and ate with us. They would inquire about Pakistan and we unanimously agreed that the media misrepresented both countries. In a candid conversation, we all agreed that we are diverse yet similar. Amid the session breaks, Professor Jasbir would hold my hand and sit with me on the stairs to share wisdom just like a mother would with her daughter. Another Hindu Professor would ask me, with tears in her eyes, about Sialkot and Hyderabad where her forefathers lived. While I teasingly eyed Professor Mohan’s bag to win my share of chocolates, which he only gave to his favourite people, another professor would lovingly remind me not to forget gajar ka halwa/gajrella (carrot dessert) that was especially made for us. Others would come and appreciate our dramas. Yes, they are huge fans of our drama industry and are very fond of Humsafar and Fawad Khan. Many of them have DVDs and cassettes of Omar Sharif, Moin Akhtar, Dhoop Kinaray, Sunehray Din and Tanhaiyaan! Even though our policies may differ, the lineage of our people traces back to each other’s land. It was incredible to see people approach us to ask about Islamabad and Lahore. People from the media, students, professors and friends, all seemed delighted to see us and said it was a moment of history. On our way back, I revelled in the memory of my experience and the warm people I met. Simultaneously, I was struck with a pang of sorrow upon realising the distances we have grown in our hearts. Looking out from the window of the plane and observing the landmarks, I kept thinking about how borders and barriers seemed shadowy, useless and rather unnecessary dividers. Will we ever change the course of our story? The context of our grand harmonious past being the cause of our happy ending after an abundance of plot twists? Will our love ever transcend boundaries? The author is a Lecturer in the department of English, female campus, at the International Islamic University, Islamabad. She is also working as a coordinator of the Critical Thinking Forum at the university. Currently she is pursuing PhD from Royal Holloway University London, UK. A grand wedding or a happy marriage, what's more important? If you couldnt attent Jaipur Literary Festival then you should go back again. Great blog. Very uplifting and so detailed. Been to Jaipur a few years back. Thank you for visiting my town. I am not sure what parts reminded you of British Raj but most of the buildings constructed on Jawahar Lal Nehru Marg (JLN Marg for short – Where Rajasthan University is located) were constructed post or at the cusp of Independence following Jaipur’s own architecture (Rajputana) and usage of Pink stones, facade and . Even the new Vidhan Sabha (Legislative Assembly) building follows the same architecture. Yes, most of the India is like that where a Mosque, a Gurudwara, a temple, a Church are close by. Anyone can go anywhere without any issue. You’re a research associate in the dept. of English and this is how you articulate? Through a tame, dull, insipid, non-provoking, unoriginal, uncritical picture of one city of India? What impression of India changed after you visited India? That India being perceived as an enemy country, is still much like Pakistan? If so, where have you articulated that except for explaining the weather and food and shops and buildings? ‘My preconcieved notions bit the dust as soon as I landed’. This sums up all. Those who seek the oneness underlying the eternal human search for peace, tranquility and harmony with nature will be at home in the most alien culture and among the most dissimilar people. And those who seek differences will not be disappointed to find them in their own backyard. But yes, overall, India is pretty much a peaceful, happening place. There are just about as much Muslims in India as there are in (or probably even more than) Pakistan. And yet, we don’t have suicide bombings or bomb blasts or schools getting attacked, or people dragged down from buses and killed. May your tribe grow, dear author. You talk as if all this happened many centuries ago! 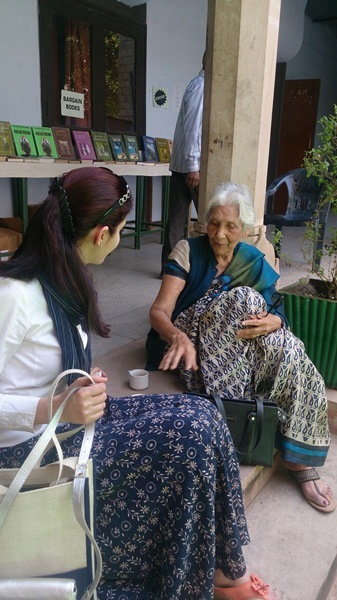 There are still people living who have seen the horrors of partition. At best Pakistanis can be polite but their inherent bias does come to the fore now and then. Hard for a zebra to change it’s stripes. YOU are right. No one would want to claim ‘sameness’ with YOUR kind. Hopefully, you are an exception. Perhaps, all Hindus are not like YOU. teach a lesson to anyone who dare raise an opposition. 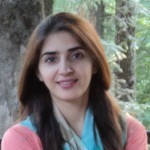 Enjoyed the blog.I can relate to Ms Farooq as I had similar and very pleasant time when I worked in Pakistan several years ago, was based in Lahore & Gujjaranwala, traveled extensively within Punjab in connection with my work. During my time there not once I was stopped to check me even during very late night travels. Every where I went was received very warmly and respect. Upon my arrival at Lahore airport I was greeted by Immigration officer with a warm hug! We have seen what Islamic people did in 1947 and in the past with Indian sub-continent. We see the examples of what Islamic people did in Egypt, Iraq, Iran, Lebanon, Brunei, Malaysia. What they are currently doing in Syria, Afghanistan, Pakistan, Niger, Nigeria, Libya, DRC, Indonesia, Thailand, US, UK, France, Belgium. – Hindus do not convert forcibly at gun point or by sword. – Hindus do not empty the bus and pull down everyone who is a minority and kill everyone. If he is from Hindustan, why can’t I call him Hindu? Thanks. Yeah I saw those place too. Hindus are also known as having a stunted gene. That precludes any normal and evident thought processes. all said by their very own PM Modi. Well, maybe it was the title that was wrong. Perhaps a better title would have been: “my rich experience in Jaipur” or something even more boring.